Housing market should be improving. Specifically due to the decline in rates, increase in real wage growth, and the decline in housing price growth. However, even with these positives, we’ve only seen a modest uptick on top of weak sales last year. Most of the sales growth has been limited to the top end of the market. March housing market index was steady at 62 which missed estimates for 63. Underlying data supports MBA’s findings that the upper end is doing well. While first time home buying is weak. Traffic index fell 4 points to 44. Anything below 50 signals a contraction. That means traffic is falling at an accelerated pace. Since first time buyers purchase homes at lower prices, they have a small impact on sales and a disproportionately high impact on traffic. I’m surprised to see traffic so low in March since rates have fallen. It’s possible that when rates started to fall there was a burst of buying which it has since dried up even though rates are low. It’s worth noting that entry level housing is less popular now. It doesn’t make financial sense to pay closing costs and move into a house if you plan on living there for less than 7 years. If people are avoiding entry level housing, they are making the smart move. In prior generations, you would see young people in their 20s buy an affordable house and then move into a more permanent house in their 30s after they saved up enough money and built equity in their house. Housing Market Index - Now, millennials are buying their first house in their 30s and staying in it longer. Technically, we don’t know for sure what they will do because millennials haven’t reached their 40s yet. However, logic tells us buying a bigger home at a later age would mean moving less afterwards. Current sales index increased 2 points to 68. Forward 6 month sales index increased 3 points to 71 which is very strong. It’s possible people see rates falling and are starting to look for housing. It can take months for people to find a house. You would think that would show up in the traffic numbers. But there must be some reason optimism increased and is very high. Both sales and expected sales are their highest level since October. Technically, if the 6 month predictions from late last year were accurate, we’d be headed for a few more bad months. However, I think sentiment was too pessimistic at the time. Overall, the South and the West were the strongest regions as their readings were at or near 70. Also, the Northeast and the Midwest were near 50 which means they saw very little improvement. February existing home sales report beat results by a lot, supporting the idea that housing demand could be coming back. The two big issues with the existing home sales report in general are that it is backwards looking (unlike pending homes sales) and that existing home sales don’t add to GDP because already built houses are changing hands. The existing home sales report is important though because it measures most of the housing market. As you can see from the chart below, existing home sales were 5.51 million which destroyed estimates for 5.1 million and slightly beat the high end of the consensus range which was 5.47 million. Sales were up from 4.93 million, meaning this report made up all the ground that was previously lost and more. Monthly growth increased from -1.4% to 11.8% and yearly growth increased from -8.7% to -1.8%. Housing Market Index - Report was helped by both the West and the South. The West had been dealing with wildfires which depressed sales in previous months. Its sales were up 16% monthly and down 7.9% yearly to 1.16 million. Price growth in the West has stalled as Seattle’s housing market is no longer one of the hottest areas in the country. The South is the country’s largest housing market. Its monthly sales were up 14.9% to 2.39 million. The Midwest even did good, which is different from what was shown in the housing market index. Its sales were up 9.5% to 1.27 million. Single family sales increased 13.3% monthly to 4.94 million and condo sales were flat at 570,000. Supply increased 2.5% to 1.63 million which helped sales growth. Without this supply, the market would have been very tight. Even with this increase, the inventory of existing homes fell from 3.9 months to 3.5 months. Sometimes when sales increase, it increases owners’ willingness to sell. That being said, it’s not a sellers’ market by any means. 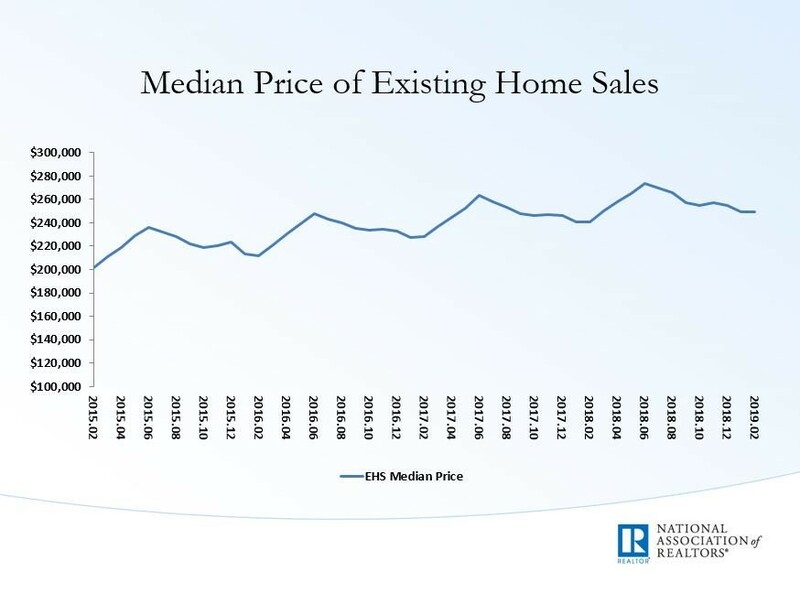 As you can see from the chart below, the median price of existing homes only increased marginally to $249,500. Price has been range bound since 2017. This low price growth is part of my thesis as to why housing demand will increase this spring. 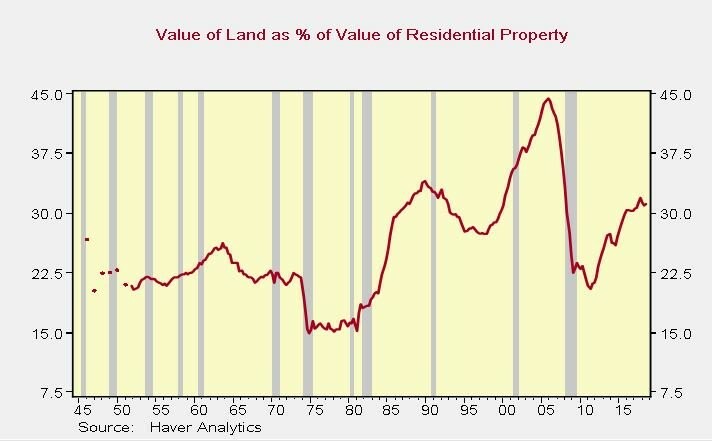 As you can see from the chart below, land value as a percentage of residential property is relatively elevated compared to all periods since 1945 besides during the housing bubble in the early 2000s. Some say people who make money off land without doing anything are rent seekers. That’s an argument for another day. The point here is land price increases are part of the reason housing is considered unaffordable by many first time home buyers. Zoning restrictions increase land prices artificially in cities. Housing supply doesn’t come close to meeting demand. Investors have been looking for the housing market to improve this spring selling season. Mostly because of the strong labor market and declining mortgage rates. Most indicators are similar to the housing price index in that they show only modest improvement. Existing home sales report is one of the few housing market reports that showed a lot of improvement, but even it was down year over year. Unfortunately, this report doesn’t help GDP growth. But it does give us a signal the decline rates is finally flowing through to demand.